Enhance your desktop with organization and style. Heavy-cast polished acrylic for durability and a sleek, contemporary look. 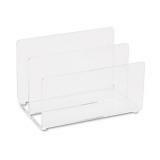 1 3/4" sections for organizing mail, notes and messages. Provides a clear view of contents for quick retrieval. 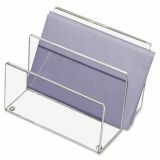 Kantek Acrylic Mini Sorter - This Mini Sorter is ideal for organizing mail, notes and messages and provides a clear view of contents for quick retrieval. Heavy cast acrylic offers durability and a sleek, contemporary look. The nonskid feet protect your desktop.